• Shutdown Current <1 uA, No load current is 1.77mA. • Standard 2.54 pin output, 3.3V-GND-VIN (face to top), can be used as a normal SMD part. • 1.5V VIN -> 3.1xV output, still can drive a lot MCUs. I had similar high power consumption issues with this NRFduino from electrodragon. It turns out it was the attached flash module that was consuming a lot of power. I was able to reduce the sleep current by immediately powering down the flash module. I am considering ordering several of these for new and future sensors. I thought I saw this board supported by myscontroller bootloader in 13pre or the github dev branch but cant seem to find it at the moment. Has anyone tried this FOTA? @xreichardx I have not tried the myscontroller bootloader, sorry. 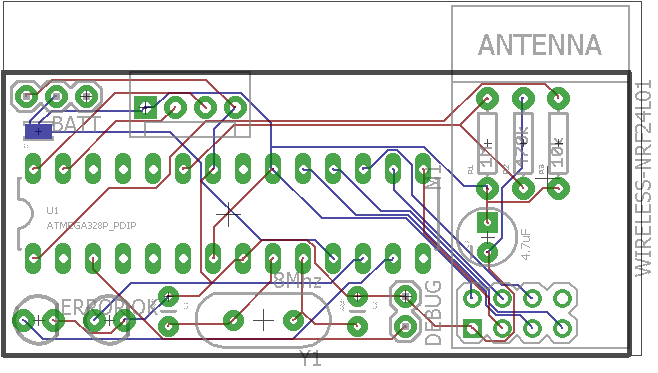 I received my order of these nrf24duinos and loaded up a Nodemanger BME280 sketch. Currently running on a battery and waking up every 10 minutes. I installed the spiflash.h library, added the "SPIFlash flash(8);" but flash.powerDown(); throws the an error during compilation "class SPIFlash has no member named 'powerDown". I opened the spiflash.h library and no powerDown defined. I did see sleep() though. Interesting. I might be using a different library. I would stick with the LowPowerLab version, looks like sleep is equivalent to power down. I guess I'm using this library, https://github.com/Marzogh/SPIMemory. It was renamed to SPIMemory. Thanks, I'll check out that library as well. After four days of operating on a 18650 battery, the battery voltage hasn't dropped from full charge voltage of 4.12v. I was quite pleased with the nrf24 range of these ElectroDragon boards as well. @sergio-ramos Did you have an issue with one? I have purchased many of them and have not had one problem. @xreichardx that user was fake, copying a question from earlier in this thread and later editing the post to contain spam links. @mfalkvidd Thanks for doing this kind of work (deleting fake users and stopping spam). I am sure it is not as much fun as answering real questions about MySensors topics. But I learn so much from people in these forums, that I would hate to see it overtaken by trolls and spam.